A Canadian geologist kidnapped earlier this week in Burkina Faso has been found dead, the country's security ministry said Thursday. Kirk Woodman was abducted by gunmen late Tuesday from a remote gold mine in the country's northeast region. His body was found near the country's borders with Mali and Niger in Gorom Gorom, the ministry said. Canadian Foreign Minister Chrystia Freeland confirmed Woodman's death, saying, "Canada condemns those responsible for this terrible crime. We are working with the government of Burkina Faso and other international partners to pursue those responsible and bring them to justice." The company's chief executive, Adam Spencer, said: "Kirk was an incredibly accomplished and highly respected geologist with a career spanning over 30 years, with 20 years spent in West Africa." Woodman's death raises concerns about Islamist factions making forays into the country, which so far has been spared the violence that has plagued its neighbors. 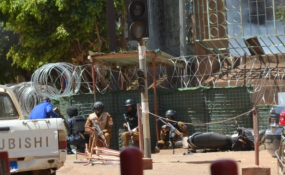 Woodman was kidnapped on the third anniversary of an attack on a hotel in Burkina Faso's capital, Ouagadougou, that killed dozens. That attack was claimed by al-Qaida in the Islamic Maghreb.